We’d love your help. 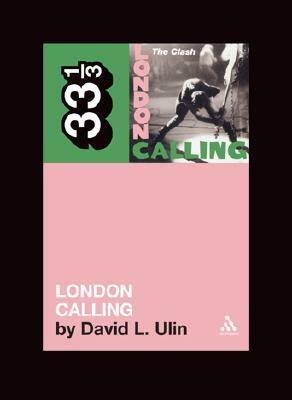 Let us know what’s wrong with this preview of London Calling by David L. Ulin. To ask other readers questions about London Calling, please sign up. The world has spun a few times since "London Calling" was released back in very late 1979 (on vinyl, natch! ), but the love fest that has sprung up in its wake continues to gather steam. For my money, it's always been a great (if somewhat slightly overrated) album, as well as the album on which The Clash began to squander their greatness. From here, it would be a long, sad downward spiral through "Sandanista" and into the abyss with "Combat Rock." As someone who prefers the friendly and comfortab The world has spun a few times since "London Calling" was released back in very late 1979 (on vinyl, natch! ), but the love fest that has sprung up in its wake continues to gather steam. For my money, it's always been a great (if somewhat slightly overrated) album, as well as the album on which The Clash began to squander their greatness. From here, it would be a long, sad downward spiral through "Sandanista" and into the abyss with "Combat Rock." As someone who prefers the friendly and comfortable confines of a rut, I'd have been perfectly happy if the band had continued on in the same vein of out-and-out brilliance demonstrated on "The Clash" (both UK and US versions), the vastly underrated "Give `Em Enough Rope," and non-LP singles and B-sides of that era like "Capital Radio," "Pressure Drop," and "1977." On the other hand, by my count, I've bought the damn thing four times and as far as re-issues go, The Clash remain one of the only bands I'd cross the road for. Althought it seems pointless, repetitive, and tiresome to go into too much depth recounting the original album's highs and lows - chances are if you're reading this, all 19 tracks are probably burned onto your frontal lobe - Ulin acquits himself quite nicely here althought things get a bit dry in spots. But what do you expect? Music is meant to be listened to, not read about. So let's cut to the chase: Topper Headon's performance behind the drum kit is worth the price of admission alone; tight, compact, and propulsive. The title track (as someone who abhors the Beatles, I love to rub the phrase "Phony Beatlemania has bitten the dust" in the faces of friends who think the Fab 4 hung the moon), "Brand New Cadillac," "Clampdown," "The Guns of Brixton," and "Death or Glory" all bristle with old-style Clash aggression, anger and energy, while "Spanish Bombs," "Lost In The Supermarket," "Lover's Rock," "4 Horsemen," "I'm Not Down," and (whew!) "Revolution Rock" may leave you scratching your head and wondering just what it was about this band that made you think they could change the world. He is also the editor of three antholo David L. Ulin is book critic, and former book editor, of the Los Angeles Times. He is the author of The Lost Art of Reading: Why Books Matter in a Distracted Time, Labyrinth, and The Myth of Solid Ground: Earthquakes, Prediction, and the Fault Line Between Reason and Faith, selected as a best book of 2004 by the Chicago Tribune and the San Francisco Chronicle.